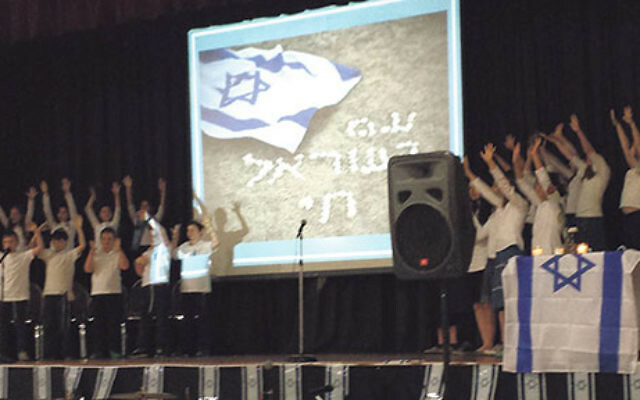 Children from the JEC Yeshiva of Elizabeth choir sing in celebration of Israel at the Union Y. In a tradition the Union Y community has come to rely on, on Thursday evening, May 12, Israel’s fallen heroes and their families were honored in a ceremony marking Yom Hazikaron, immediately followed by a shift to upbeat gaiety in a celebration of Yom Ha’atzmaut, Israel’s Independence Day. That mood switch echoed what Israelis had faced the preceding two days, and the way they bridge those two aspects of the nation’s life each year. About 200 people gathered at the YM-YWHA of Union County for the event. The program, shaped and orchestrated by Israeli shliha Tehila Magenheim, featured the choir from the Jewish Educational Center’s Yeshiva of Elizabeth and young presenters telling the harrowing stories of two families who lost soldier sons in recent years: Michael Levin, a “lone soldier” killed in the Second Lebanon War, and brothers Uriel and Eliraz Peretz. A rousing performance by musician Eitan Katz and his band followed the Yom Hazikaron ceremony. Rabbi Chaim Marcus of Congregation Israel in Springfield reflected on that same appreciation for Israel. “We never take for granted what we’ve been given,” he said. The event, jointly sponsored by the GMW federation’s Global Connections department; the Y, an agency of the federation; and Masa Israel, was funded with donations from the Halpern and Kramer families. The community also took part in a Yom Ha’atzmaut Family Celebration on May 15 at the Gottesman RTW Academy in Randolph.